Heading north from Ios going back to the northern bay of Paros (Ormos Naousis) we opted for the shallow channel between Paros and Anti-Paros. Having settled weather and the wind from the right direction we headed slowly through the west channel (west of the island Remmatosini). 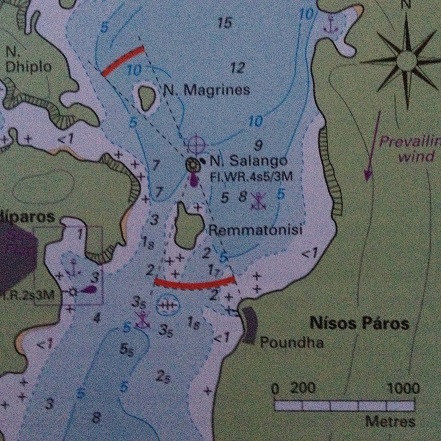 In the Greek Waters pilot (Rod Heikell) the recommendation is to go through the eastern channel, but recent reports on the internet reports minimum depths of 3,5 mts in the western channel. We headed through the western passage and with a draft on Dora Mac of 6ft we had 1,9 mtrs on the depth sounder in the most shallow parts. Allthough moving slowly and with good circumstances for eyeball navigation the passage was to thrilling. As far as I´m concerned the eastern passage would have been a better choice allthough both passages demands calm weather. Rod Heikell: " If annyone out there wants to survey either passage again in calm weather ,please let me know the results"